We are excited to have you consider using The Lice Boutique for guaranteed lice removal during this stressful time. We know that when head lice enter your life, it is a traumatic event. We do not minimize the anxiety and stigma that head lice bring to your household. We do, however, provide a lice removal service that helps you return to your normal lifestyle in a fast, painless, professional, and caring environment. The Lice Boutique in Port St. Lucie, Florida is centrally located on U.S. Highway 1 to serve the lice removal needs on the Treasure Coast. We are a bright and positive environment that may remind you of a hair salon as you walk through our door, but we do not do hair. We only provide guaranteed nit and lice removal treatment. The Lice Boutique uses a tried and true process for removing all head lice and nits, which are lice eggs, from the head of an infested individual. 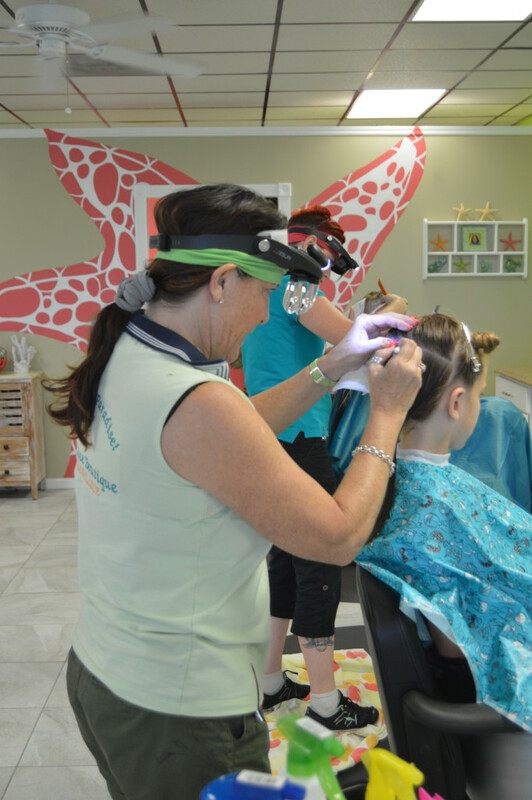 We absolutely guarantee our work and relieve you of head lice in just one visit! Additionally, if you follow our protocol you will never have a serious lice outbreak ever again. The Lice Boutique does not use harsh chemicals or gimmicks to remove lice. We are certified by The Shepherd Institute, which is recognized as one of the top lice experts in the world. This means our technicians are all trained in a methodical process where we go through every hair on the head of an infested individual and remove all live lice and nits from the head. You leave The Lice Boutique with our guarantee that you are lice free. We provide you and your child with this guarantee in writing so you go back to work and school immediately and peace is restored to your household. The Lice Boutique technicians are moms, and this means we relate and appreciate what you are going through. Since we are designed by moms to serve moms, you will find that your Lice Boutique experience will be met with care and understanding.